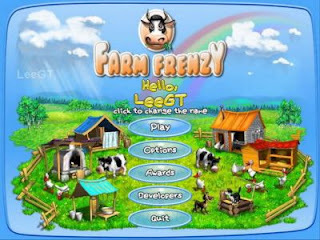 Farm Frenzy 2 is an arcade-style game with the unique game play genre and cheerful graphics developed by Alawar Entertainment for iphone, ipod and macintosh platforms. It offers players to transfer a usual farm into a rich and flourishing agricultural complex. The game is quite exciting and it involves you the more and more more you play it. The game is really a good opportunity to acquire some skills in farming. In case you've decided to move to the countryside you'll be at least prepared theoretically about what's going on there. Namely you'll grow grass, feed chickens, collect eggs and then take all you produce to markets. From there you'll spend the money you earn on additional buildings that produce exciting new products including delicious steaks, tasty cakes and quaint down home apparel. The only thing you have to watch out are bears tending to your farm but thankfully dogs are on hand to help drive them away. The game offers: five kinds of store products; four varieties of animals; four types of marauding bears; 12 structures with 3 types of upgrades; 16 types of products for manufacturing; 17 hilarious gags and 19 trophies. ﻿Farm Frenzy 2 is available for $ 2.99 at the iTune App Store.